Foreign Object Debris (or FOD) is a huge problem on aircraft carriers. A metallic button from a shirt or a single nut could destroy a million dollar engine and endanger the lives of an aircrew. America's solution? FOD walks and sweeper carts. Russia’s solution? Taking an old MiG-15's jet engine, slapping on a planar diffuser, and strapping it to a tractor. I doubt such a contraption can compare to a good FOD walk, where the carrier's deck crew and other available hands scour the flight deck one step at a time (above), or the little sweeper carts the US Navy uses (below), but it sure does look cool and it probably even sounds cooler! 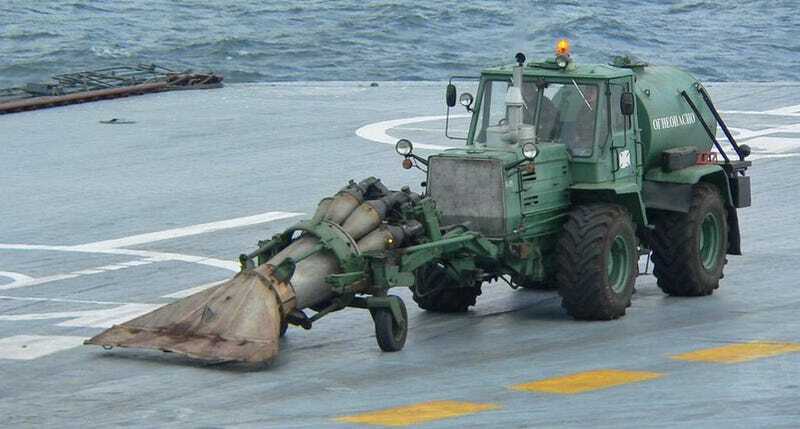 The engine shown in the pictures – taken aboard the Russian aircraft carrier Admiral Kuznetsov – appears to be a Klimov VK-1, which is actually a knockoff of the Rolls Royce Nene engine. The Nene was used in many early jet aircraft applications, both in Britain and North America. On this side of the world, the Nene was license built by Pratt & Whitney and labeled the J42. Copies of this engine are still flying in private warbirds and even in a small handful of air forces that still fly the MiG-15, namely North Korea. Main photo via twitter/RussianNavyBlog, Klimov Vk-1 image via J JMesserly/wikicommons.